Environment minister who is more famously known as Youth Olympics Overbudget Minister commented on his facebook in Sept that his fav jogging track is submerged. 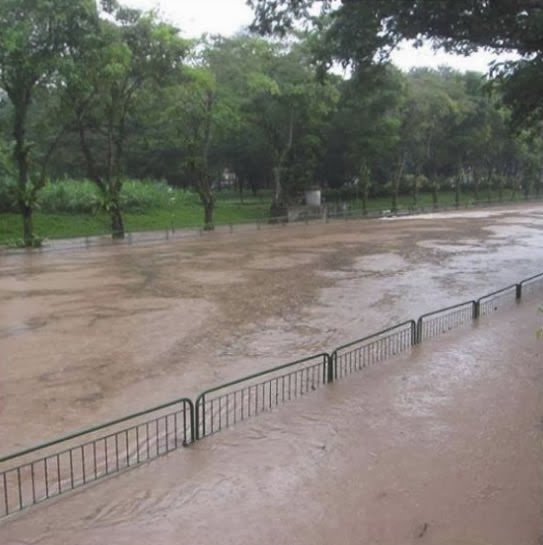 Netizens picked it up & spread it on forums as it was the worst flood so far this year - blogpost: Biggest Flood So Far in 2013. "My regular jogging track under water. This morning's heavy storm brought more than 100 mm of rain to the Kent Ridge area with major flash floods especially at AYE and Commonwealth Avenue. Both the Sungai Ulu Pandan and Sungai Pandan Kechil overflowed their banks. Drainage improvement work at Commonwealth Avenue will be completed by June 2015. Now that i have a digital camera i can finally show the no flood & flood pictures. What intrigued me about the picture he posted is how near it is to where i live because i can recognize the vertical concrete cylinder. Below is the flood picture taken by him & subsequently spread online. Above is my approximate picture - 4 trees to left of cylinder, 10 trees to right of cylinder. In terms of height you can obviously see from the railings that he is standing on higher ground to avoid getting his legs submerged in floodwaters. This type of storm drain is consider the biggest capacity on this tiny island. Look at how overwhelmed it is from the heavy downpour due to climate change. Got taxpayers $$ to waste on this smaller underutilized track. How does his fav jogging track look like & where is it? It is opposite the Ghim Moh jogging track at the Pine Grove estate(i seriously doubt he lives there but at the landed houses close by). 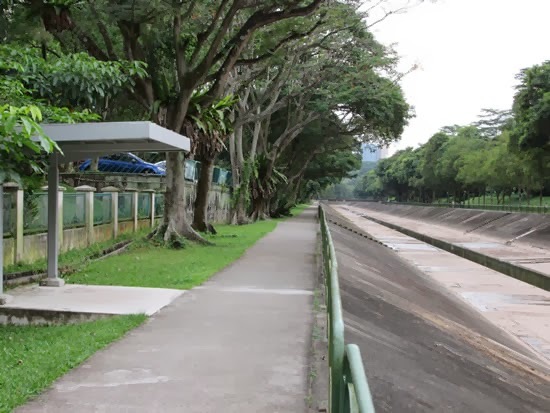 Another shocking fact you might not know is that this smaller jogging track is built for elites like him. Why his favourite? One can easily guess to avoid the peasants like me cycling or jogging on the bigger track opposite. 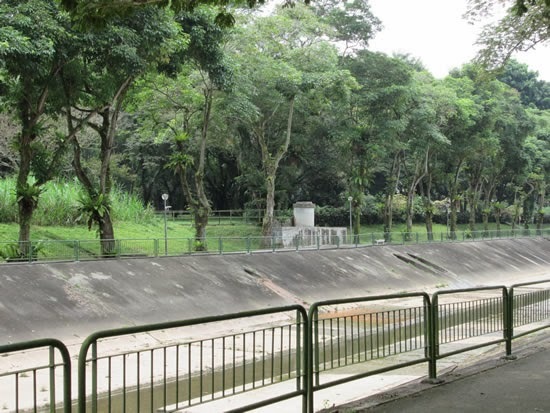 I took the no flood comparison picture by traveling further up a bit on this 'elite' jogging track used by the Youth Olympic Games Overbudget Minister. Waste of taxpayers $$$ building this underutilized smaller & shorter track. Look at how new the cement surface of the shelter is. Though not very visible at the background but there is a bridge to the Ghim Moh track(right side of pic) used by peasants. Those staying in landed houses can cross the bridge over to jog & cycle so there isn't a real need to waste taxpayers $$ on the above 'elite' track. But no taxpayers $$$ to build footpath for peasants like you & me. How many peasants live in those pigeon holes compared to private houses in same land space in tiny SG? The footpath for peasants is sponsored by a supporter of the hybrid regime. In return his name is shown to joggers & cyclists at the park connector where i took the picture. 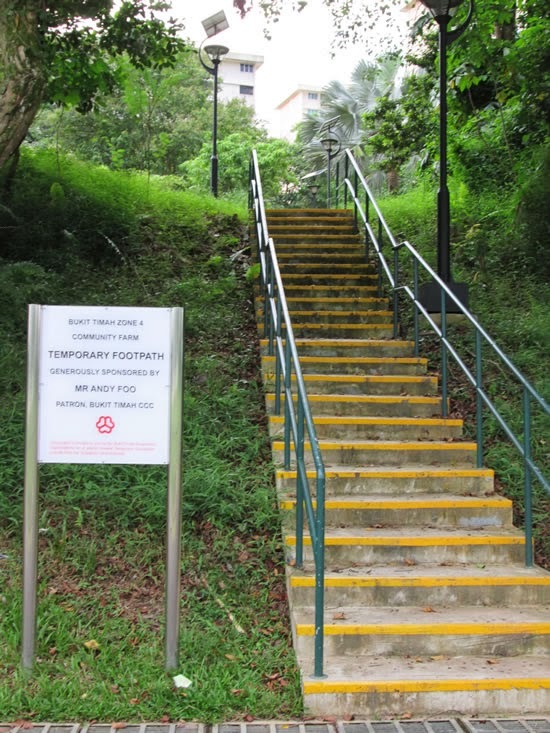 It bewilders me why 60% vote for the hybrid regime which screws them - temporary short footpath some more compared to the longer permanent 'elite' one.